Spring snow goose hunting is a pastime that is full of fun,is thrilling, action, and full of adventure. For people in love with action-filled activities, goose hunting simply means a battle between flying and their own skills as an outdoorsman. Wonder why anyone would spend countless hours arranging decoys, waiting for geese, observing and chasing these birds? Well, try being part of a hunting trip, and you’ll know the reason. It’s all about passion and witnessing one of the most astonishing sights in nature. After all, nothing in the world can match the beauty of thousands of birds flying together as they make their way back to the breeding grounds. Want to feel the exhilaration for yourself? Read through this snow goose hunting guide to enjoy everything snow goose hunting Missouri can offer you. You can’t enjoy any waterfowl hunt unless you know how to get camouflaged. After all, you wouldn’t want to be spotted by a flock. Stay hidden in your field and don’t make any quick movements. This is the most effective strategy for concealment in spring snow goose hunting. If you are a seasoned waterfowl hunter, you would definitely know the value of decoy placement. Haven’t been a part of any hunt trips? Accompany your hunt buddies or join in on a guided hunt. Hunting guides and outfitters have the right knowledge about the tactics, tools, and methods involved in goose hunts. With their help, you can bag many more geese. 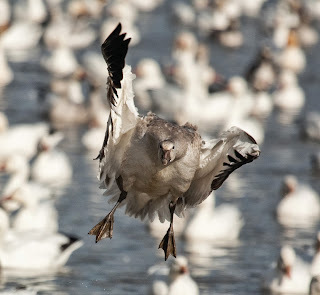 If you’ve just started hunting spring snow geese, large flocks will definitely mesmerize you. Learn to make use of every opportunity. However, don’t try to flock shoot at too many birds at the same time. Be patient and shoot at a single goose and when it is hit move to the next bird. While following this method, you are less likely to miss the birds that are in your shooting range and will cleanly take more birds per hunt. Eager to witness the beauty of innumerable birds flying over rice and corn fields? Join a hunting guide to learn about the right equipment to use ideal shot size, legal shooting hours. Guides will have the electronic calls that will help provide you with an ultimate hunting experience. Spring snow goose hunting expeditions are certainly full of astonishing sights that you will not be able to forget soon. Don’t let your excitement disturb your focus. Looking for that memorable hunt or want to enjoy every aspect of spring snow goose hunting Missouri? Brace yourself and kick off the hunting season with a guided snow goose hunt!